Thursday, April 16 I heard a cover of Lorde’s Royals on the trombone and I’m not even sure if that’s the best thing I heard that night. On the Third Thursday of the month, Real Phonic Radio Hour presents music at the James J Hill Reference Library. Each month is something different; April was a month of instrumental wows! The Charlie Hunter Trio brought us Jazz – really happy, very loud Jazz with a twist of upbeat blues. Charlie Hunter plays guitar. It’s not experimental, but it’s different. He did a series of four albums, each highlighting different artists including The Cars, Hank Williams, Core Porter and Duke Ellington. And that’s the kind of range you hear on stage – everything is different with an air of familiarity – including a brief interlude from White Christmas. Hunter also serves as the glue between Bobby Previte on the drums and Carly Meyers on the trombone. Previte played the fastest cymbals I have ever heard then turned around to treat the cymbal like a Theremin, shaping the aura of the sound without touching the instrument. He played the drum rims like a pinball machine and proceeded to play the whole stage like a drum – literally jumping down from the drums and playing any surface in his path. Meyers played Lorde on the trombone – and it was really good. What else can I say? There were songs where she nailed the circus trombone or New Orleans processional march and even a little blues but really … Lorde. Molly Maher played serious guitar with Gabriela Sweet accompanied by JT Bates and Chris Bates. I saw them play together at the Lowertown Guitar Festival last summer too. Both accomplished guitarists. The stage looked like a very high end guitar store! Sweet played an sang a Cuban dance song; it was beautiful. She and her music seem so elegant. Maher brings an energy and an Americana sensibility and it’s fun to watch how much she loves the music and feel the contagion of the songs. They played a song by Kevin Washington that sounds like a storm rolling in featuring everyone on stage playing claps and rolls of thunder to fill the room. Thom Middlebrook read Spring by Edna St Millay, a good reminder that while we may be happy to have April visit us “babbling and strewing flowers” that we’re still on a “flight of uncarpeted stairs” on our way to having our brains “eaten by maggots” underground. Hearing poetry read aloud is always a luxury! Middlebrook’s choices always make my MA in Literature seem almost worth it. 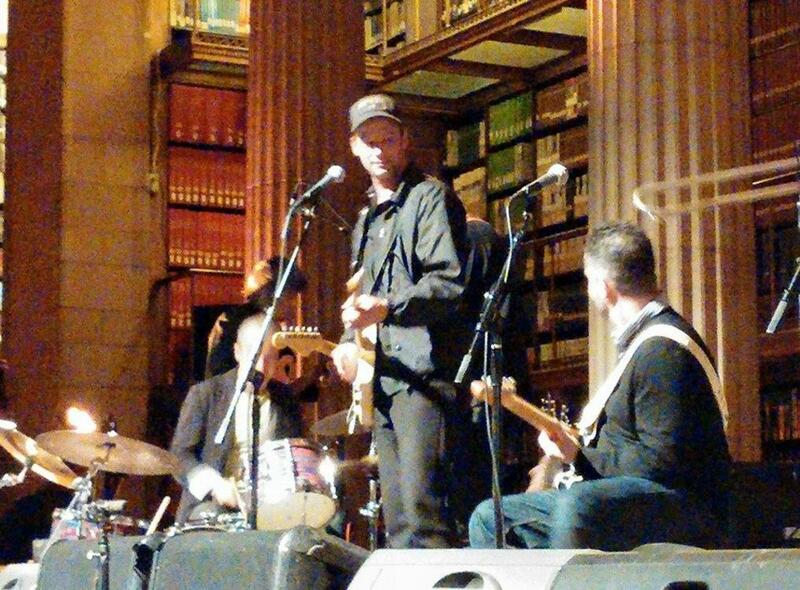 Bookending the night as usual was Erik Koskinen and the Real Phonic Radio Band (Paul Bergen, Frankie Lee and JT Bates). This month we got a sneak preview of his latest album, which will be released on Record Store Day at the Electric Fetus. A highlight was Will You Feel my Love, which we’ve heard rehearsed or workshopped over many months at Real Phonic shows. In fact the new release was all recorded at Real Phonic shows. It will be fun to hear.